But that's tomorrow. Today I'm here to share with you my last two Scrap FX projects for the month! The theme is "Birthdays" and what luck- my beautiful niece Lilah just turned two this past Friday. Of course I attended her party and my sister Kelly even asked me to play photographer for her, so I got my pick of photos with which to work! ~ I've used my Martha Stewart Texture Effect (new fave of mine!) to create the "stucco" texture on my title and the flourish below it. I then used some light pink ink to dab over the top to blend it with the rest of my layout. ~The bird house and "Adore" frame were just covered with gesso. The bird house I also dabbed with my "shabby tote" ink and then blended again with more gesso to give it an aged look. ~Fiskars Embossing Border Punc "All-A Fleur"
~I've again used the texture effect on both pieces here. I love the uneven, rough texture it produces, and just a hint of pink ink is all it needs to blend nicely with the rest of the elements! 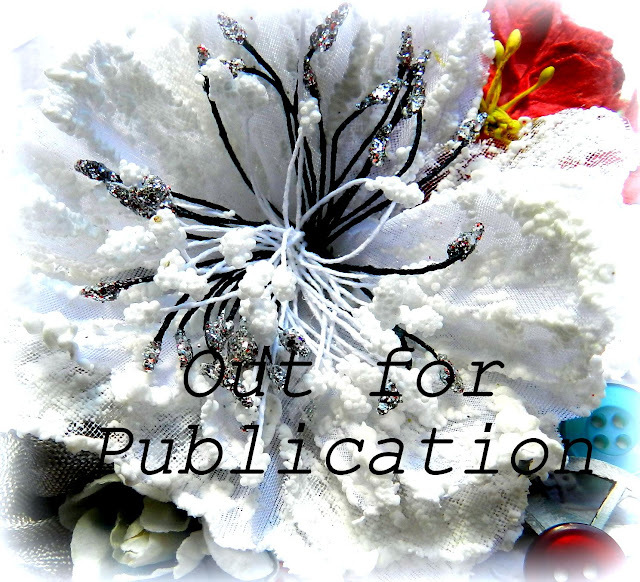 ~Fiskars Circle Border Punch "Dancing Daisies"
Thank-you so much for taking a look at my projects today! If you're interested in getting ahold of some Scrap FX products, you can always drop a request at your local scrapbook store :)! 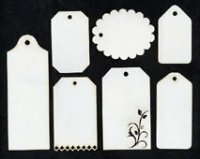 Or you can find them online- I've now added the links of the stores online who carry their chipboard- you can find these links in the "Scrap FX Design Team" tab at the top of my blog. Have a beautiful day and I'll be back again soon! AAAAAAwwwwwwww you know I love that photo of my beautiful girl!! And you have given it the perfect home on your absolutely GORGEOUS layout!!! I am in love with the colors you used, and all of the lacy borders make this so feminine and wonderful. The photo does not do your card justice, it is just so beautiful. I have taken it out and admired it a few times over the past few days, it's just gorgeous. I know it was a card for Lilah, but I won't allow her to touch it for a few years, lol!! WOW! These are just beautiful! Absolutely stunning! Wow, your work is beautiful. Love the happy birthday. The colors are amazing and your niece is a doll. Have a wonderful anniversary. Oh wow, your layout is totally magical! What a perfect way to scrap this wonderful pic! both projects are simply beautiful- and what an adorable little niece! This is beautiful. Great picture and congrats on your anniversary. So many Gorgeous array of of details... LOVE the clusters & what you have done with the chippie looks AMAZING!! Love this LO! Love the soft colors, the flowers & the bling! So absolutely gorgeous - both card and layout. wow wow wow!!! 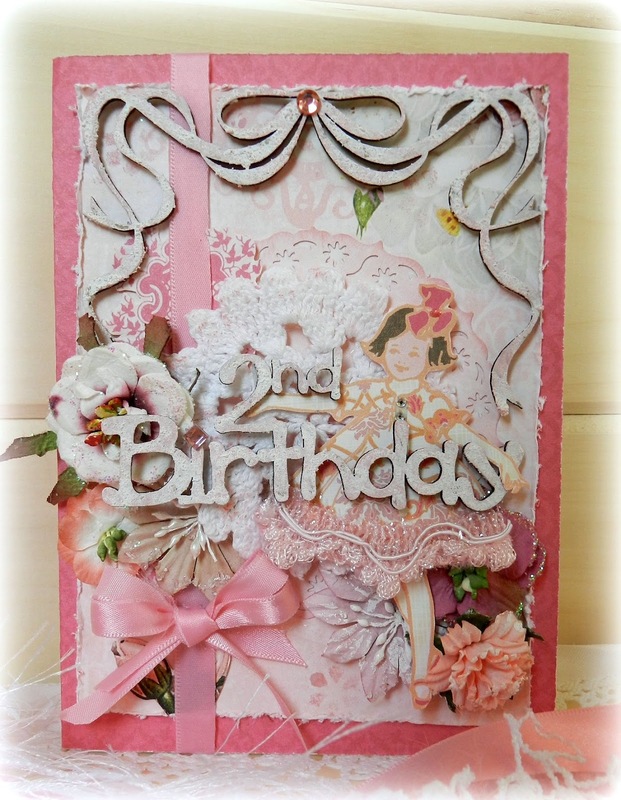 These are stunning.. the layout is exquisite and so beautifully created, and the card is so gorgeous! love them both! The photo for the LO is just magical. Very beautiful LO too. I love your works - so filled with amazing details! Erin, your photography, Lilah's sweet face and this LO make a gorgeous combination. I never tire of seeing your beautiful creations. Wow! Wow! Wow! Love your creations! Your lo is simply gorgeous...love what you've done with the chipboard and the gorgeous spread of flowers! And that card....to die for! Beautiful! Love your style! This is very beautiful! Wonderful work!!! Gorgeous page, Erin!! really beautiful! the photo is adorable! take care girl and Happy Anniversary!! Have fun! Love this Erin and the chipboard treatment looks amazing!! Just such a special page!! Oh wow Erin this is a masterpiece - all your pages are worthy of framing in my opinion!!! That photo is a treasure though. Definitely one of my all-time favs!!!! Happy Day Late Anniversary, Erin! We celebrated our 13th on Tuesday and usually have the same dilema having 3 kids, but fortunately the grandparents kept them and we were able to go out to eat! :) I love this beautiful layout and the great pic of Lilah! The colors are gorgeous on this one and the layering is fabulous!! I actually caught my breath when I saw this stunning layout! The card is pretty, too. What talent you have!